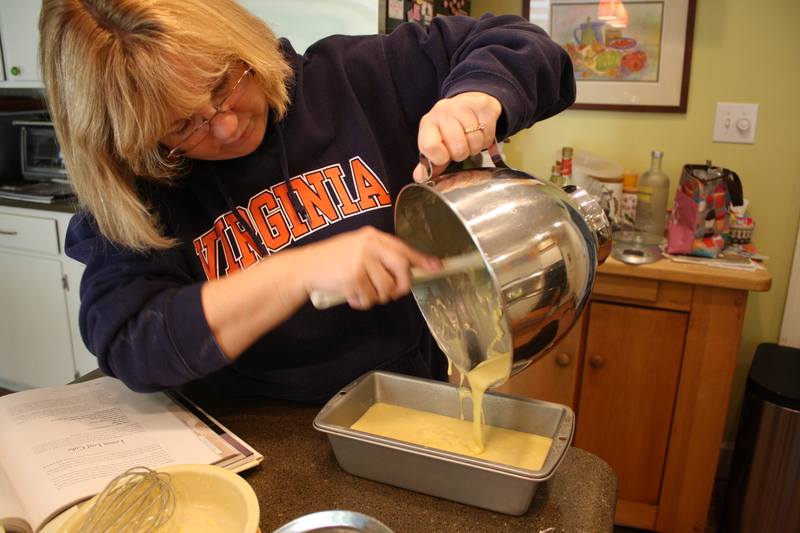 My mom and I actually got to bake together over Easter weekend! 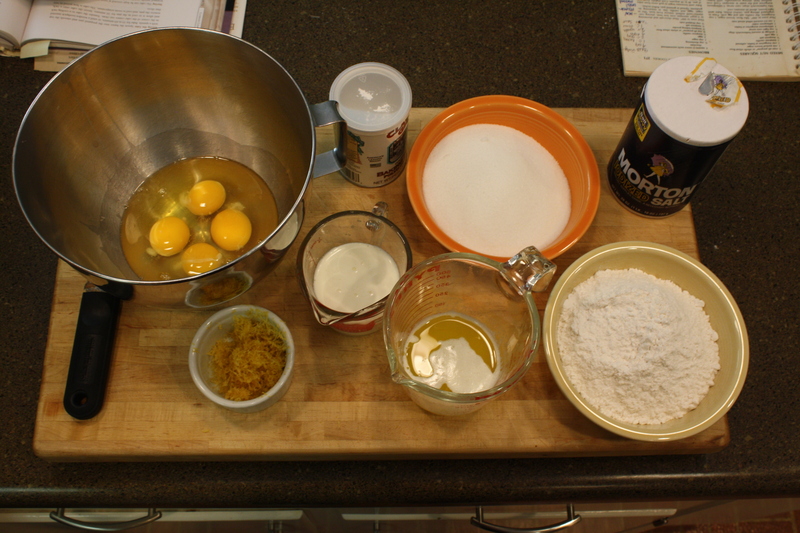 That’s a first for the baking/blogging challenge Tuesdays with Dorie, which we started in January. Normally, our “baking together” is done virtually. 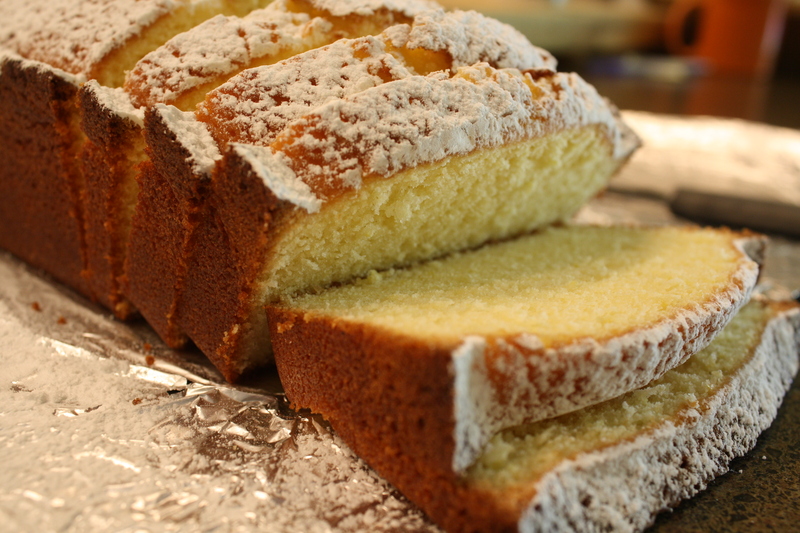 The Lemon Loaf Cake wasn’t quite what we were hoping for though. Sure, it was certainly easy to mix up in one bowl. And it had a delicious lemon flavor — it had to with the zest from three lemons. But it was just a little dry. 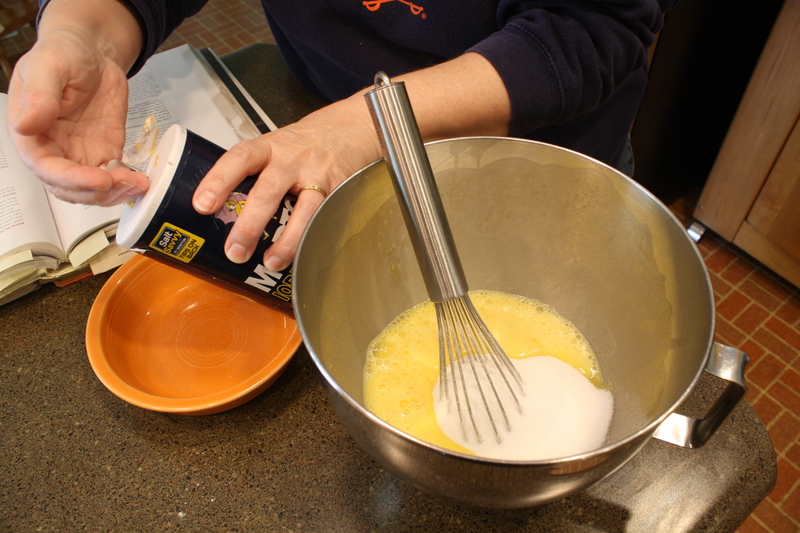 Perhaps it needed a glaze made with lemon juice and powdered sugar. 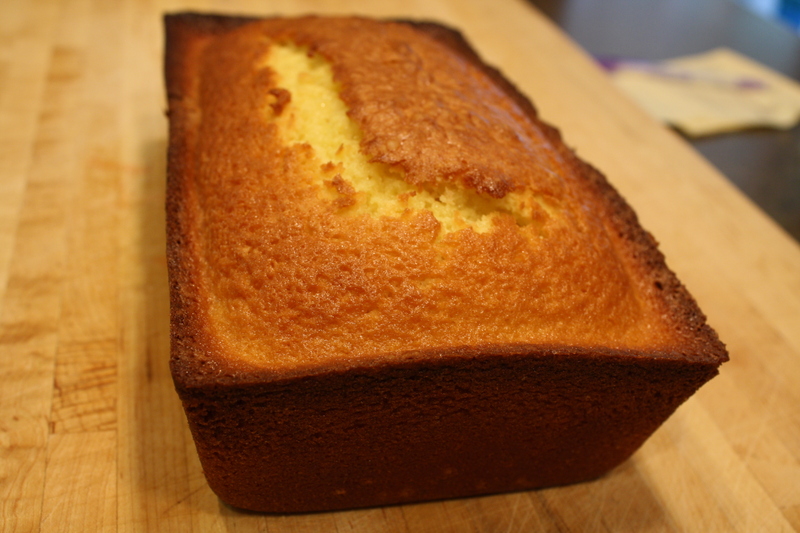 Or to be topped with lemon curd (that’s how we ate the leftovers). 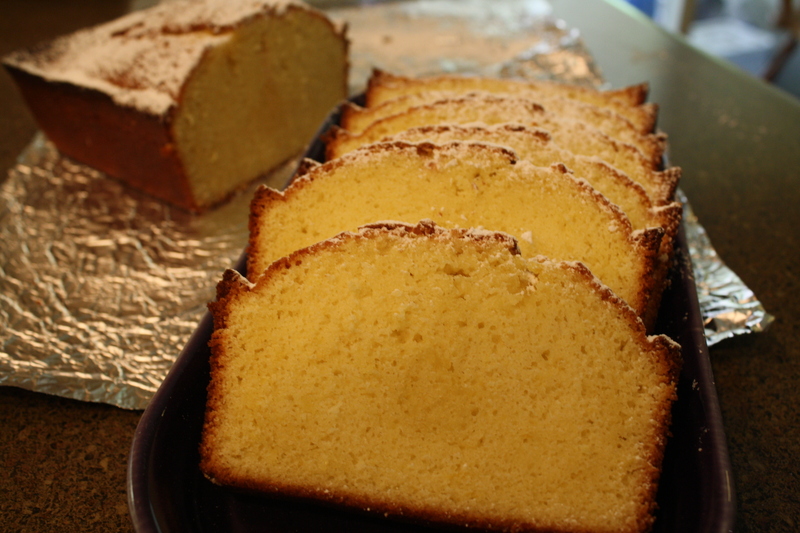 My mom said regular pound cake is better, because it is moister. We served the cake after our spring lunch at my grandparents’ house. 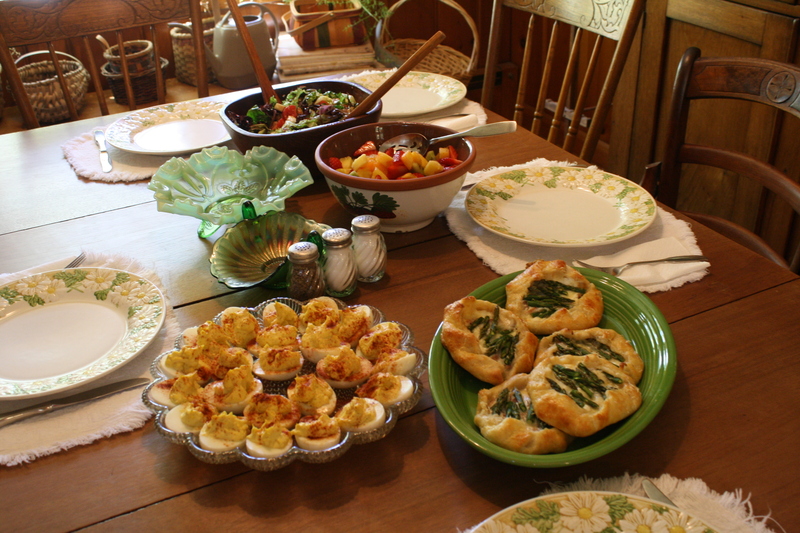 I already wrote about that delicious and fresh meal — we made asparagus and cheese gallettes (using the gallette crust from Julia, and I added prosciutto for everyone else), plus deviled eggs, salad and fruit salad. A perfect Easter spread. To see the recipes, visit Treats and The Beauty of Life. To read what hundreds of other bloggers thought of this recipe, check out Tuesdays with Dorie. Here are all our ingredients — plus the zest from several lemons. The cake did have a strong lemon flavor, at least. It was easy to mix together all in one bowl. 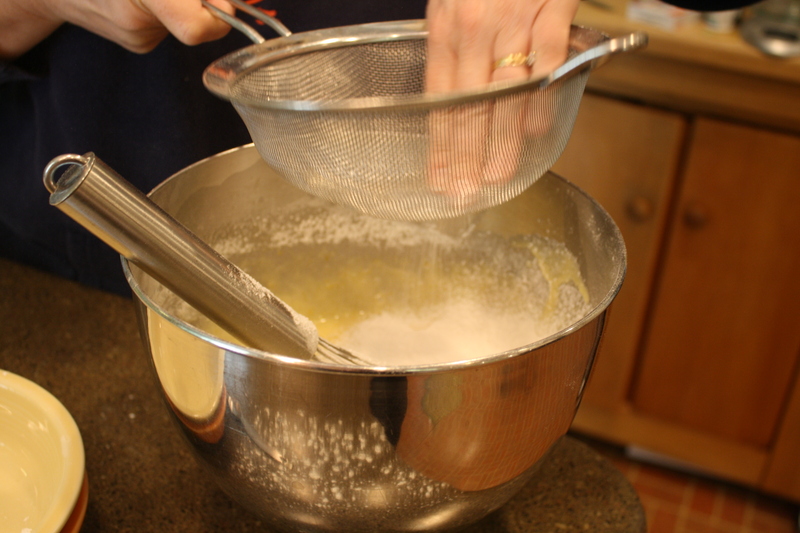 The strands of sifted flour and the egg mixture looked pretty. My mom didn’t fuss too much when photographed, and was a willing model this time. Yours came out brilliant.. and so did the photographs!! How fun to bake with your mom. Looks lovely. What a great looking meal! Sorry this cake wasn’t a huge hit for you, but it looks lovely. How fun to cook with your Mom!! I like the idea of the powdered sugar! I can almost smell the lemon from here. 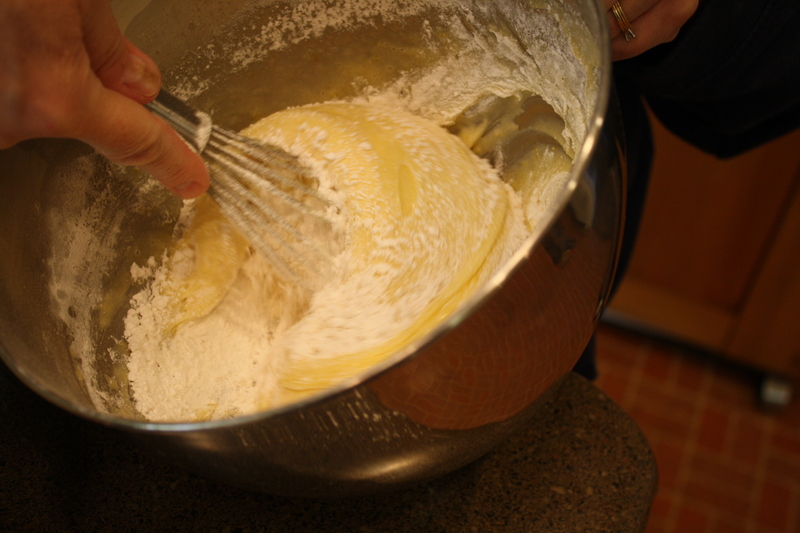 Love the baking shot photos, too.